A high school student in Utah decided to wear a cheongsam to her prom. Everyone went wild after one person labeled her a culture appropriator on Twitter. Why? She is a non-Chinese person in a garment considered emblematically Chinese. The Twitter commentator, ostensibly of Chinese descent, was offended because she appeared to be taking his culture and using it in a casual, commercial sense, as a costume. The student defended herself by stating she was showing appreciation for Chinese culture and simply thought the dress was beautiful. These are obviously sensitive issues and I want to unpack why this type of situation has the propensity to blow up. Social media allows things to spiral out beyond calm arguments and can often throw red herrings into important issues that deserve attention. While I am no fan of analysing this case to death by exploring the history of the qipao/cheongsam, and trying to precisely pinpoint who is right or wrong, I do appreciate the discussion it leads to, as eye-roll inducing as it can initially be. Culture is an evolving and unsteady creature. It adds, subtracts, adapts, and is difficult to clearly define. And yet, the reality is that there are indeed generally assumed definitions of cultures, by country, by region, by groups of people, by organisations, and so on. 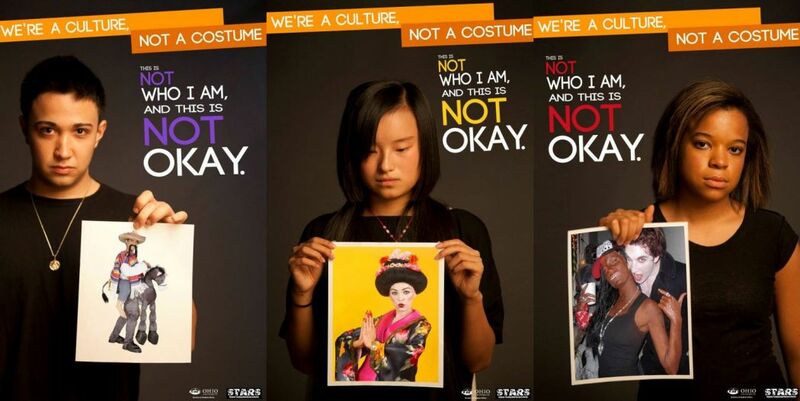 Posters against cultural appropriation made by students at Ohio University. Photo: Students Teaching Against Racism in Society, via Facebook. Humans like to typecast as it makes it easy to understand the world. Such type-casting and categorizing allows us to get to decisions quickly, and it necessarily means that we assume definitions and even benefit from having communally recognized assessments. Yuval Noah Harari spells this out far more eloquently than I might in his wonderfully written bestseller Sapiens. Such type-casting also takes on very visceral personas – how one looks or speaks can mean serious racial discrimination when value is assigned to one type over another. Culture operates in the context of power. While all cultures tend to think of themselves as the absolute and most special, complicated histories of exploitation, war, colonialism, and imperialism mean that we often carry the weight of history with us, in how we identify, or with what we are involuntarily identified as because of how we look, speak, and present ourselves. While some of us will want to believe everything is on an equal playing field, sensitivity arises from the fact that this is about dominant culture versus minority culture. The reality is that Asian culture is a minority culture in the American context (and yes even using the very general term Asian to categorise an entire diverse continent) and faces plenty of discrimination in myriad circumstances. Simply based on that, while I don’t condone the severe reaction in this case, I understand why an American of Asian descent might be irked by a white Caucasian person wearing what he thinks represents his culture. I am an American of Indian (sub-continental) descent and while it’s not my personal custom to wear Indian clothes on a daily basis, I do know I would be stared at if I walked around in a sari in the U.S. It wouldn’t just be “I love your culture” appreciative glances, but “you’re a foreigner, and therefore suspicious” ones as well. I have no issues with anyone else wearing a sari, but I understand the momentary exasperation that may come from seeing a white Caucasian woman in a sari who does not carry the constant experience of being a minority, who would not experience what I would, if I wore one. 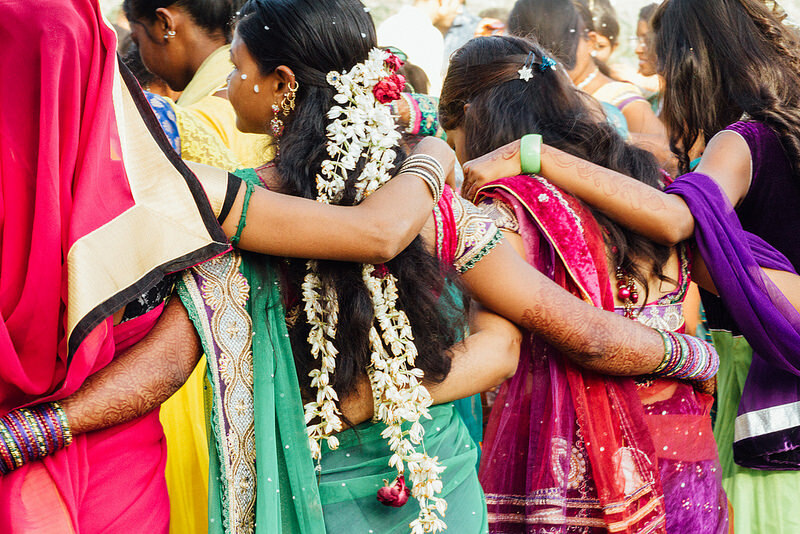 Saris. File Photo: Adam Cohn, via Flickr. This is not because I think I own the sari or want to deny anyone their right to wear a beautiful item of clothing, but because I am aware that visual representation of Indian culture is not always positively perceived in a white majority country. All this to say, people who belong to certain cultures are not always comfortable wearing clothing associated with their cultures, because of past experiences of being alienated, talked down to, and discriminated against. Therefore, when they see others assumed to not be of that culture wearing that same clothing, it can lead to a whole heap of sensitivity. Then there is the matter of intention. Is the festival-goer at Coachella in a Native American feathered head-dress intending to wear it as a fun costume, or within the context of understanding the history of a population derided and massacred in the United States? Sensitivity is key, and my suggestion to all of us is to simply bear that in mind next time we reach for something generally associated with a minority culture where we live, particularly when we might belong to the more historically privileged group there, in that context. It did not surprise me in the least that Twitter commentators from China were quite confused about the uproar over the Utah teen debacle, but I’d wager they don’t share the experience of being an Asian minority in the U.S. with the original offended party. A lot of us here in Hong Kong have fluid and multi-cultural identities, and perhaps this makes us especially suited to understand all the grey areas in these situations.